Making your own crackers is surprisingly easy, yielding delicious, healthy, and richly varied crackers for the home chef. 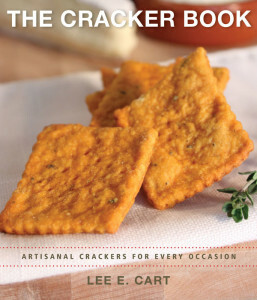 The Cracker Book includes recipes for over fifty different crackers, from black olive crackers to traditional graham crackers to crackers fashioned from cardamom and whole wheat, black pepper and rye, blue cornmeal and red pepper, lemon and poppy seed and many more. The cracker ingredients move well beyond traditional wheat flour crackers to include brown rice, oatmeal, wheat germ and more—even gluten-free crackers. As a bonus recipes for over a dozen delicious and interesting dips and spreads are included as the perfect complement to home-made crackers. Lee E. Cart lives in central Maine with her husband, Jeffrey, in the post-and-beam house they designed and built. She has lived off-the-grid since 1987, using solar panels and batteries to power her home. She has written for Gastronomica, The New Maine Times, the Christian Science Monitor, High Country News and other publications. She lives in Wellington,Maine.